Missionaries from the Eastern Mennonite Board of Missions and Charities Mennonite Church (EMBMC) first arrived in Somalia in January 1953. This venture represented the first Protestant witness in that country since the Swedish Lutheran Mission was asked to leave in 1935. In 1958 its headquarters was in Mogadishu, the capital city, with three other sta­tions in Mahaddei Uen, Margherita, and Torda. The staff consisted of four missionary couples, two nurses, three short-term workers, and a Pax unit of three men. For the first 16 years the mission programs expanded rapidly to include five locations and more than 30 missionaries. Emphasis was given to establishing service ministries which were requested by the Somali people and government. This included several schools, a clinic and hospital, and other small community development programs. The coming of independence in July 1960 spawned a search for new understandings of truth, faith, and the will and peace of God. The military takeover in October 1969 and eventual nationalization of all mission properties and programs in 1972 significantly altered mission involvement in Somalia. Educational personnel were reassigned to teaching positions in various government schools. Changing government policies eventually led to all mission personnel being asked to leave in 1976. In 1979 Mennonite Central Committee (MCC) formed an agreement with the Somali government to give assistance to refugee needs. A year later workers from Eastern Mennonite Board of Missions and Charities were able to return to Somalia. As of December 1986 there were 13 EMBMC workers (plus children) assigned to educational and medical programs. The MCC team of 7 persons worked with long-term development needs of refugees. The local Christian fellowship continued under national leadership, although in a less structured way. Despite the changes of the 1980s EMBMC, MCC, and other workers supported and encouraged the fellowship by their presence, service, and witness. Horsch, James E., ed. Mennonite Yearbook and Directory. Scottdale: Mennonite Publishing House (1988-89): 160. Kraybill, Paul N., ed. Mennonite World Handbook. Lombard, IL: Mennonite World Conference, 1978: 99. Mennonite World Handbook Supplement. Strasbourg, France, and Lombard, IL: Mennonite World Conference, 1984: 15. Bender, Harold S. and Kenneth M. Nissley. 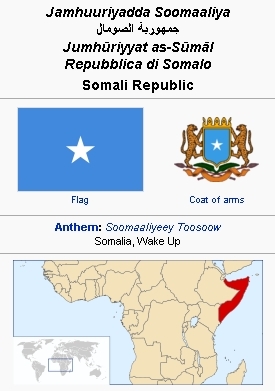 "Somalia." Global Anabaptist Mennonite Encyclopedia Online. 1989. Web. 20 Apr 2019. http://gameo.org/index.php?title=Somalia&oldid=121759. Bender, Harold S. and Kenneth M. Nissley. (1989). Somalia. Global Anabaptist Mennonite Encyclopedia Online. Retrieved 20 April 2019, from http://gameo.org/index.php?title=Somalia&oldid=121759. Adapted by permission of Herald Press, Harrisonburg, Virginia, from Mennonite Encyclopedia, Vol. 4, p. 572; vol. 5, pp. 840-841. All rights reserved. This page was last modified on 28 April 2014, at 02:56.